A Third objection against constant communion is, that it abates our reverence for the sacrament. Suppose it did? What then? Will you thence conclude that you are not to receive it constantly? This does not follow. God commands you, "Do this." You may do it now, but will not, and, to excuse yourself say, "If I do it so often, it will abate the reverence with which I do it now." Suppose it did; has God ever told you, that when the obeying his command abates your reverence to it, then you may disobey it? If he has, you are guiltless; if not, what you say is just nothing to the purpose. The law is clear. Either show that the lawgiver makes this exception, or you are guilty before him. Reverence for the sacrament may be of two sorts: Either such as is owing purely to the newness of the thing, such as men naturally have for anything they are not used to; or such as is owing to our faith, or to the love or fear of God. Now, the former of these is not properly a religious reverence, but purely natural. And this sort of reverence for the Lord's Supper, the constantly receiving of it must lessen. But it will not lessen the true religious reverence, but rather confirm and increase it. It seems to me that Wesley's reference to "the newness of the thing" is in reference to a practice becoming routine, which will happen to anything we human beings do over time. Those who fret over the loss of meaning are really concerned over losing the feeling of doing what one has never done before. In this case celebrating Holy Communion once a month or once a quarter will also lose its sense of newness over time as even four times a year can become routine. But this entirely misses the point of the significance of constant Communion. The meaning of the Lord's Supper is not found in our own personal appropriation of its meaning; its significance is found in the sacrament itself and reason why we are to celebrate in the first place. Communion must be constant because the Lord's Supper must become a habit just as prayer. Have you ever heard anyone say, "Well, I only pray once a month because I don't want talking with God to lose its meaning?" Discipleship is a daily thing, and in order for it to be daily, there are certain habits that embody such discipleship-- among them are daily prayer and constant Communion. I wonder what my wife would say if I came home one evening and said, "Honey, I have decided I am only going to tell you I love you once a month because I am afraid if I tell you too often, it will get old and lose its meaning?" On the contrary I tell my wife often that I love her, not because if I don't she will get worried that I no longer do, but because my love for her is too important to fail to tell her as often as I can. And the same is true with our children. Our adult daughters who no longer live with us never end a phone conversation with me without my utterance of those all-important words, "I love you." It's not a matter of my words losing their meaning; it's about my love for my wife and my children being so constantly expressed in word and in deed that it becomes a habit. And since my love for them is a habit, they can depend upon it. In my own free church tradition, Zwingli's practice of quarterly celebrations of Communion have taken hold. That radical reformer from Zurich felt that quarterly celebrations of the Lord's Supper were sufficient lest the meal become too commonplace, too ritualized. This is an odd point of view. Odd because five hundred years of experience in those churches that adopted the Zwinglian practice shows that churches which commune less frequently value Communion less. Odd because of the biblical and historical testimony of weekly celebrations of the Eucharist. Odd because reformers such as John Calvin and Luther hoped to establish weekly Communion. The celebration of the Lord's Supper should become a habit for disciples because sanctification is an ongoing activity in the life of the believer and the church through the power of the Holy Spirit. And Holy Communion is a sanctifying sacrament. It is appropriate that Father John have the last word. The grace of God given herein confirms to us the pardon of our sins, by enabling us to leave them. 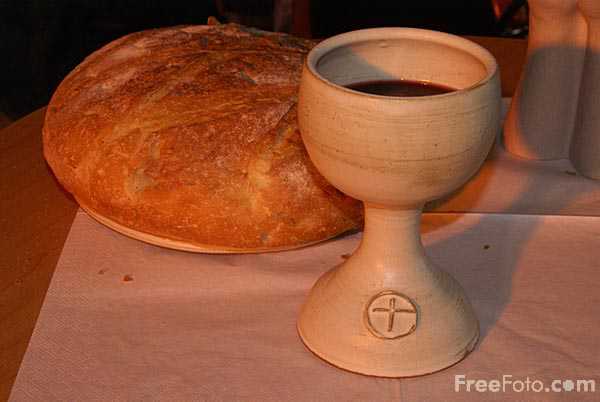 As our bodies are strengthened by bread and wine, so are our souls by these tokens of the body and blood of Christ. This is the food of our souls: This gives strength to perform our duty, and leads us on to perfection. If, therefore, we have any regard for the plain command of Christ, if we desire the pardon of our sins, if we wish for strength to believe, to love and obey God, then we should neglect no opportunity of receiving the Lord's Supper; then we must never turn our backs on the feast which our Lord has prepared for us. Do this often in remembrance.... Indeed! Great post and this is the reason why I pushed us to have communion weekly at all three of our worship services. It has revolutionized our worship as the means of grace for which it is intended. Thanks for your comments. I hope to work toward that as well.